This photo says so much. Priceless. I love this picture you took! I have heard of the people in Nepal and how nice they are! I am hoping to experience & visit as well this country! Thanks again! and good luch to you! Great shot! You can see the clashing of culture, the modern clothes and shoes amongst the old way of living. What a priceless image. You are truly talented to see this…Bravo for you and your efforts in this life. 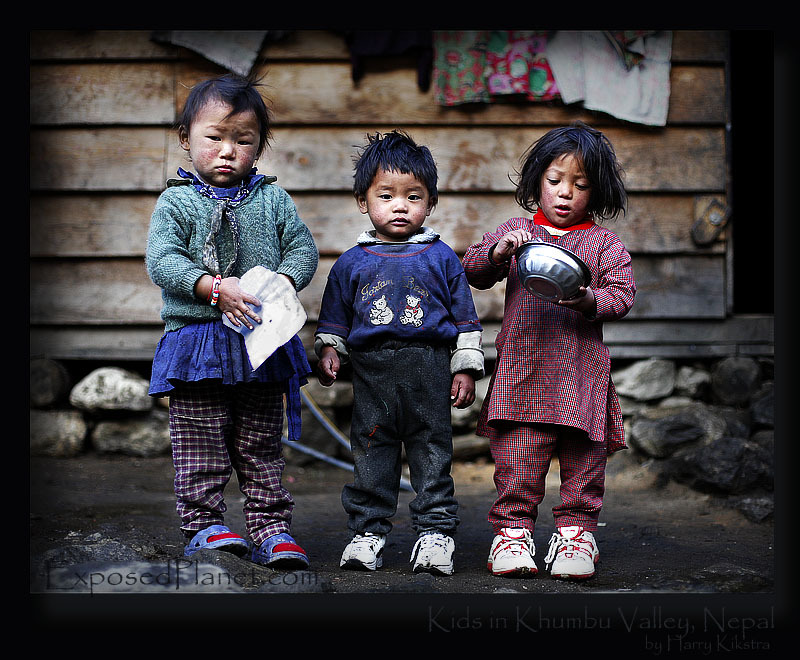 The story behind "Three Nepali kids in the Khumbu Valley"
There are 2 main ways to get to the Mount Everest Basecamp. In Tibet you can drive all the way (to 5200m altitude! ), in Nepal you will have the pleasure to trek for about a week. After flying to Lukla (landing on a sloping, uphill airstrip, you will walk through gorgeous valleys.